~ Kate's Life ~: A Giveaway! I love doing giveaways and it's been SUCH a long time since I've had the pleasure to host one. Today's giveaway is generously offered by Jill from Baby and the Beanstalk. I met Jill through my blog forever ago and she is just such a sweet, honest, encouraging person. I am in love with EVERYTHING on her site. 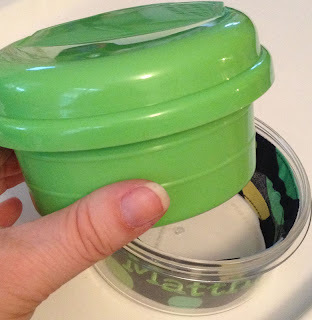 So... imagine my excitement when Jill asked me to review one of her snack cups and then give one away to one of you! First she sent me a snack cup with Matthew's name on it. She let me pick out the fabric and the font to go with it. A perfect size for Cheerios and cookies, or little bits of fruit. This cup has a very firm snap lid, ensuring that anything you put inside will be kept fresh. It's so easy to clean, too. The cup comes out of the holder for easy washing. And the embroidered piece of fabric slips right out so that you can wash the holder part as well. I knew in the first three minutes of opening the box that I was going to love this snack cup and I was right. It's practical and oh-so-cute. I love nonchalantly pulling it out of Matthew's diaper bag and having people comment on it. And no one can steal it from me because it has Mattie's name on it! How would you like to win one of your very own? 1) Leave me a comment telling me you'd like to win! That one's easy enough! Winner gets to select their choice of available fabrics and fonts! Giveaway to close on Friday June 1st at 9pm. I will select the winner using Random.org. Once you've entered, go to Jill's website Baby and the Beanstalk and look around at her beautiful creations! Good luck everyone, and thank you again, Jill! Posted by Kate at 8:53 p.m.
would love to win! what a great looking product! So cute! My babe would love that! Christine aka The Stampin' Ninja 3:25 a.m. This snack cup is darling! I want one with MY name on it! ;0) Thank you for giving us the opportunity to win one!!! 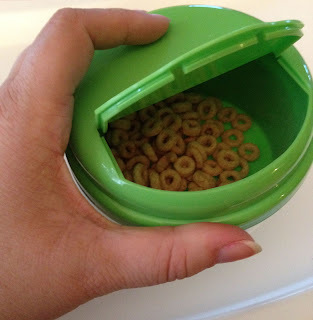 What cuter way to eat cheerios ?! I would live to win one for my snack lovin' little guy Gage :) ! So cute! I'd LOVE one of those for my little one on the way! Also, I followed her on Twitter! My Three Sons 1:38 p.m. I just stumbled upon your blog. I have three kids 4, 2, and 1 so an extra snack cup would be great. My Three Sons 3:14 p.m.
My Three Sons 3:15 p.m.
And I want to win! LOL Love you! Adorbs! And I have a sweet, sweet friend with a couple little cuties at home who would LOVE one! I'm in! LOVE this!! 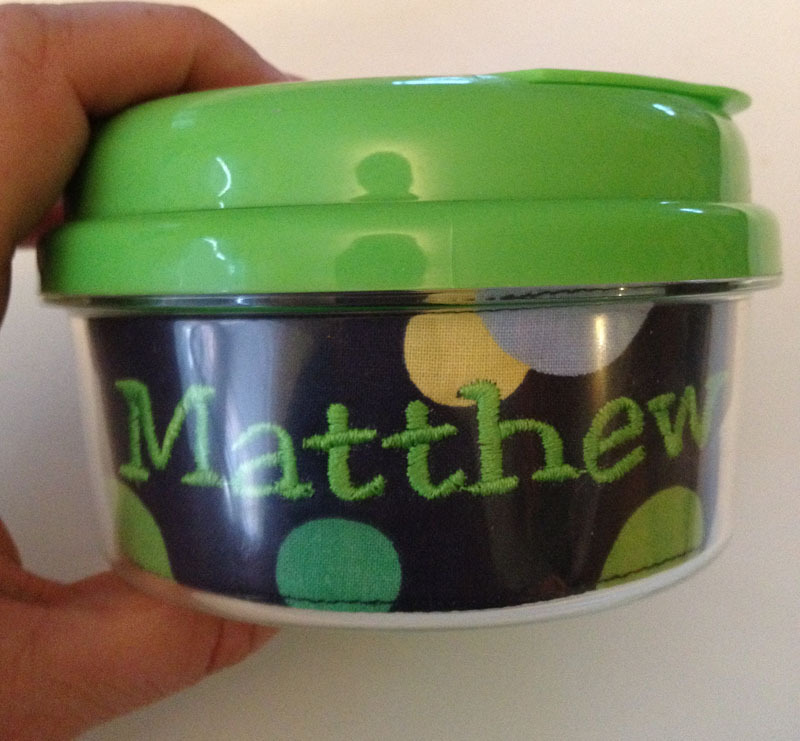 Jorgen or Maeley could definitely use a cute snack cup! However, so could their auntie!!!! ;) I kid, I kid. Well, sort of! Super cute and a great way to take snacks on the go. I'm following Jill on Twitter! ♡♥♬ Carolsue ♡♥♬ 2:53 a.m. I'd love to win this for my son, John! ♡♥♬ Carolsue ♡♥♬ 2:54 a.m. I tweeted your blog link. Ok, this comment is for liking Baby and the Beanstalk on Facebook. That looks so cool! I would love to win! cool, I would love to win!! The Sneaky Mommy 10:41 p.m. The Sneaky Mommy 10:42 p.m. The Sneaky Mommy 10:43 p.m. The Sneaky Mommy 10:44 p.m. I would love to win this for my son! Thanks for the chance. Collins would live this snack cup. Okay....Collins doesn't care what her snack is in as long as I give her one!! I'm off to tweet and follow! !